United States, Back-of-the-Book, Mint and Used Stock, Containing Airs, Special Delivery, Dues, Newspapers, Parcel Post, Offices in China etc., identified and mounted on Vario pages, duplication as to be expected, all priced and ready for retail, inspection recommended, generally Fine to Very Fine. United States, Back-of-the-Book, Back of Book Group 1879 to 1932, mint and used collection on White Ace pages in a binder, with Special Delivery, strong Postage Dues, Parcel Post, Parcel Post Due and Shanghai overprints, highlights incl. mint #E1, E2, E3, E5 (2), J1, J19, J28, J36, J37, J41-42, J57, J59 (also J21 and J27 used), Q1-12, JQ1-4, K1-15, K17-18, much n.h. throughout, condition varies, review recommended, generally Fine to Very Fine. 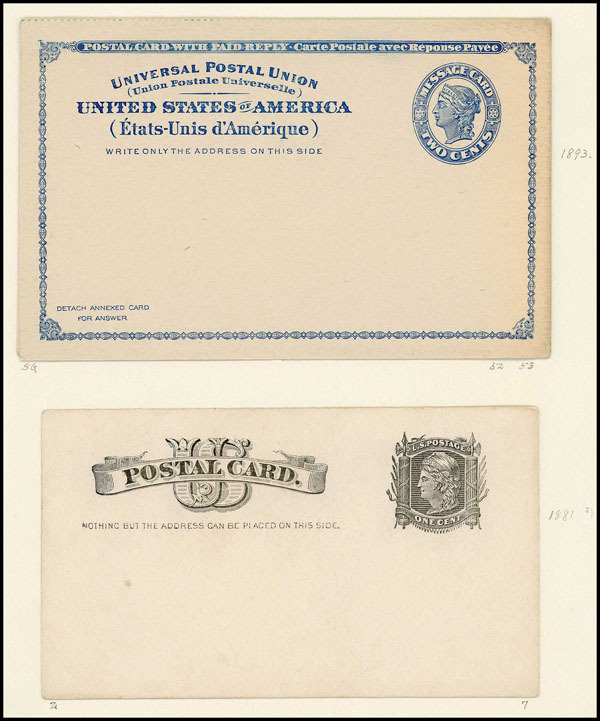 United States, Back-of-the-Book, Mint Airmail Collection, Complete from 1918 to 1989, #C1-C6 and C13-C15 o.g., balance mostly n.h., in Lighthouse hingeless album, Fine to Very Fine. United States, Back-of-the-Book, 2 Volume Mint Postal Card Collection, to 1980s mounted on blank pages, few early used incl. #UX1, mint UX8, UX10 (2 types), UY1 (2), UY3 (3, 1 used), UY10, recent varieties incl. non-fluorescent, many showing minor varieties, overall clean lot, Fine to Very Fine. United States, Back-of-the-Book, Mint Collection, Mostly o.g. 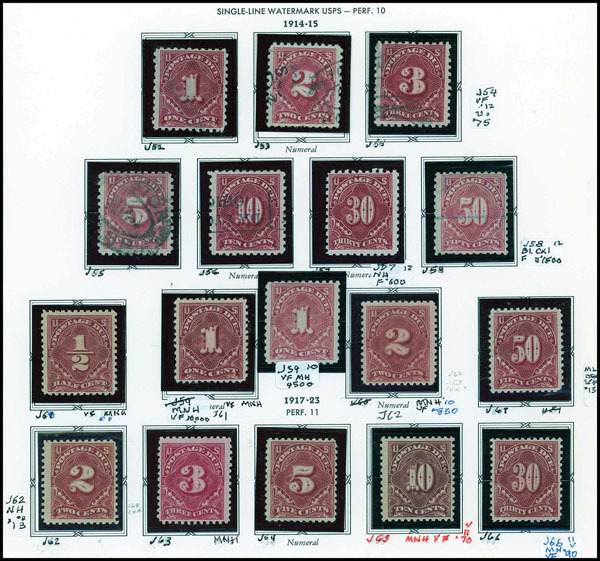 with modern issues n.h., includes #C1-C3, C18, Q1-Q12, and nice group of modern Ducks, in Lighthouse hingeless album, Fine to Very Fine. United States, Back-of-the-Book, Nice Group of Early Airmails, Blocks of 4, #C1-12 and C18, some blocks are l.h. on two top stamps, but others, including C18, are n.h., generally Fine to Very Fine. United States, Back-of-the-Book, Several Hundred Unused Mostly Postal Cards, running from the 2¢ era up to 19¢ with quite a few Airmails running to 35¢, good variety, but also considerable duplication, and a few postal envelopes thrown in, everything clean and fresh, generally Fine to Very Fine. United States, Back-of-the-Book, Christmas Seal Collection, o.g., several thousand 1907 thru 1980s, mint singles, blocks, sheets, booklets mounted on homemade and White Ace pages, plus glassines of duplicates, TB and misc. seals, generally Fine to Very Fine. United States, Back-of-the-Book, Airpost Cut Square Collection, complete to 1973, incl. #UC3 printed on both sides (other side used), Very Fine. United States, Back-of-the-Book, Mint and Used Postal Card Collection, in a binder to circa 1930s, over 100, incl. mint #UX5, UX21-22, some preprinted, internal usages, shades, postal reply, etc., mostly Fine to Very Fine. United States, Back-of-the-Book, Numismatic Souvenir Cards, About 93, mostly Numismatic with a few philatelic in a mint sheet album, very clean group, Fine to Very Fine.